Addis Ababa, 01 February 2019 – The Chairperson of the African Union (AU) Commission Moussa Faki Mahamat, received the Instrument of Ratification of the Agreement establishing the African Continental Free Trade Area (AfCFTA), deposited by H.E. Fafre Camara, Ambassador of the Republic of Mali to the Federal Democratic Republic of Ethiopia and Permanent Representative to the AU, at the AU Commission Headquarters in Addis Ababa, Ethiopia. The Republic of Mali becomes the 17th country to ratify the Agreement. On behalf of H.E. 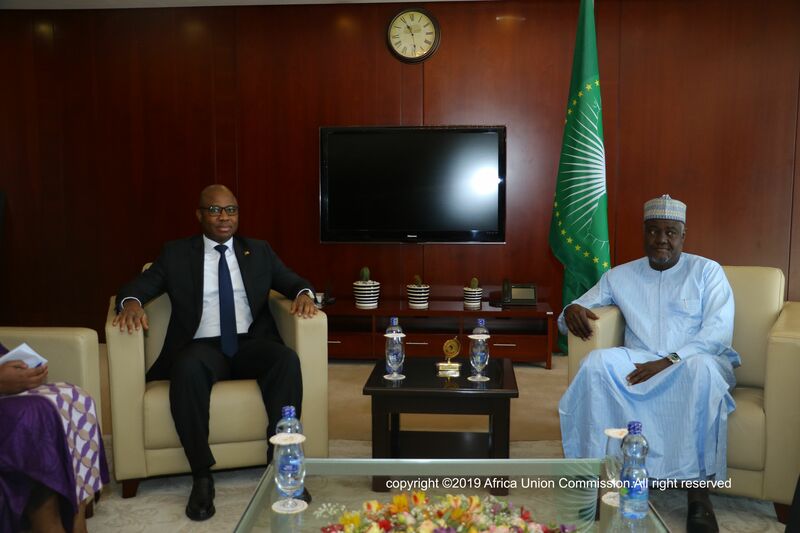 Mr Ibrahim Boubacar Keita, President of the Republic of Mali, Amb Camara handed over the Instrument of Ratification and indicated that more instruments would be deposited at the 33rd AU Summit scheduled in June 2019. Amb Camara also reiterated his President’s commitment to the AU and confirmed the participation of the President to the upcoming AU Summit. ‘It gives me great pleasure to receive this instrument of Ratification of the AfCFTA Agreement from the Republic of Mali’, said the Chairperson. The Agreement establishing the AfCFTA is gaining more and more momentum, only 5 ratifications are outstanding to reach the 22 mandatory needed for its launching, which is likely to be done during the June 2019 AU Summit. H.E. Dr Albert Muchanga, the AU Commissioner for Trade and Industry also attended the meeting.